Don’t you even tell me you have not been tempted. Don’t you dare tell me you have never been tempted to run off to the other side of the world, become an antithesis of yourself, a denial of everything you have spent time building, just to prove that you can. And what can be more romantic, more radically unconventional than the circus. Monkeys (I. Love. Monkey babies. Don’t say a word) and acrobats, lion tamers and contortionists. Lights and magic and illusion. And each morning a new road. Don’t tell me you have not been tempted. Whatever, lady. I am a banker, I hear you say. Why so am I, what a coincidence. And when the circus comes to town, small children dream of elephants and monocycles on a tightrope. But when the circus comes to the City the stakes are higher, as are the somersaults and hopes of greatness that come with it. Don’t you tell me you have not been tempted. Jump on a bandwagon. Do the jazz hand thing. Or at least take the sweet escape of the corporate circus, since you haven’t yet run away to join the real one: a little taste of freedom, a little taste of unconventional creativity. And the safety net of corporate approvals. The breath of freedom we all shared when the fintech circus came to town and our corporate overlords allowed us to train with the clowns and the lion tamers. To learn some tricks and join in some acts. And as it turned out, to talk the talk and leave the walk to others because the circus packs up each morning and decamps to the next destination so if you are the doing type you will be disappointed. But if running away from the metrics and the Powerpoint and the hard meetings and the measurements and the drudgery of talking at cross purposes was what it’s is all about, then you may be in luck. Because the circus does come to town with alarming regularity. Most recently it was fintech but don’t be fooled. There is always something. And not have to go another round of pointless fighting with the guys from the CAO’s office, or any other flavour of business prevention department. 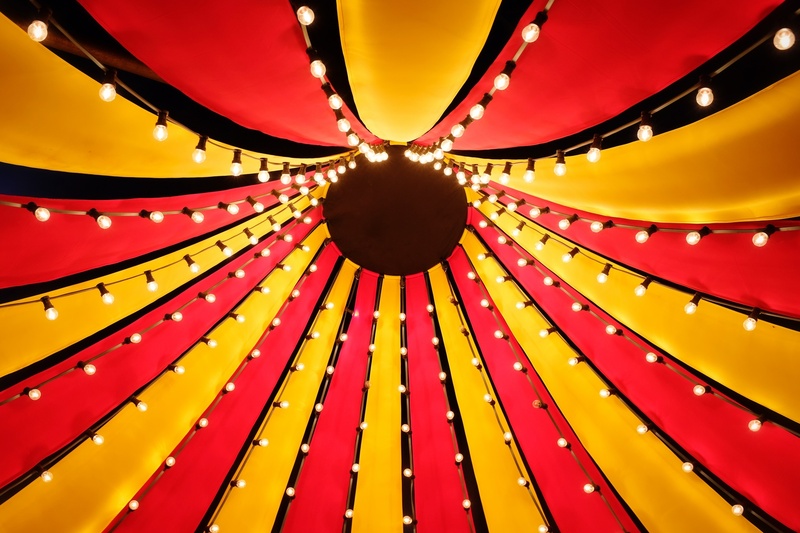 So the fintech circus didn’t take you with it. You still have to go back to the office. You still have to do projections and Powerpoints and sit in meetings that resolve nothing, address nothing, move nothing forward. And you blame the circus. For not being real. For not taking you with it. Why didn’t you keep it with you? A small scrap of sequinned costume? A peanut shell? A taste for freedom? The reality of life in big corporates is that everyone seems to resent the grey, the constraints, the lack of imagination, cooperation and flair. The lack of decisiveness and true ambition, for the team and the organisation. There is plenty of individual ambition and vying for position. Everyone vocally resents all this. And everyone feels equally innocent of creating and perpetuating it, equally helpless to change it. Trapped in the monkey enclosure and, while someone else holds the keys, it’s monkey see monkey do. And if monkey get the corner office in the process, then monkey happy even if, secretly, monkey still dreaming of open spaces, freedom and running away from the circus to whatever freedom looks like once you’ve done the circus thing. Because let’s face it, it is all a matter of perspective and although there is no life without constraints, what you do within those constraints is ultimately a matter of choice. Do you mimic the other monkeys? Do you dream of running away with the circus? Or do you actually sit up and go “hold on a minute”. Not everything is your problem, not everything is yours to fix. Knowing when to say “this is not my circus, these are not my monkeys” is important to your sanity and other people’s accountability. But equally, knowing when to own the monkeys matters. And yes this may not be your circus. Neither the corporate monkey enclosure you find yourself in nor the questionable ‘ecosystem’ that has given you a whiff of freedom and no end of headaches. And yes, you may be tempted to join the circus and run away with it. Work for a charity. Go back to school. Move to the country and start a small business. Break away from the hamster wheel. The reality is, you are here. And even though this is not your circus, these could well be your monkeys. And there is something you can do to end the madness. By expecting different and allowing different. By admitting that you are tempted to run away and so are others. So rather than all of us running away with the circus and bringing all our bad habits with us, why don’t we bring some of the circus here? Not the jazz hands and monkey noises. But the sense of freedom, magic and possibility. Have the analogies gone too far? Ok. Try this one for size. The things you want to run away from bug us all. And by thinking that they are not yours to fix you allow them to carry on. And by feeling innocent of their existence you become guilty of their perpetuation. And when you ran away to the sanctioned fintech circus you found that, actually, change is hard and it takes two things. Will and effort. In your desire to join the circus, in your dreams of leaving, you have the will alright. Now make the effort. These are your monkeys. With enough effort, courage and accountability this can become your circus. And when people start running away to join you, you know it’s working. You can read the first part – “The subtle art of holding yourself accountable vol 1: future James is busy” – here. How appropriate! I’m watching “Man on Wire” about the tightrope walker who walked between the Twin Towers and reading “Monkey”, the ancient Chinese story. I love the article! I will be nice to my monkeys. Your influence is always, always a ticket to the ball where you will find like minded folks.